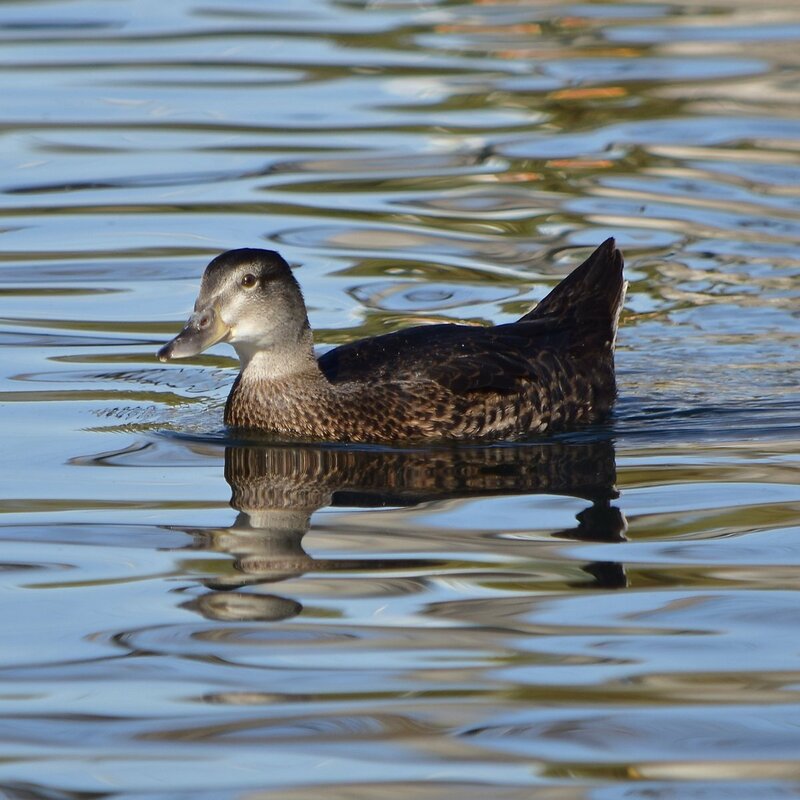 Saw this duck at a park located in Downey California a suburb of Los Angeles. 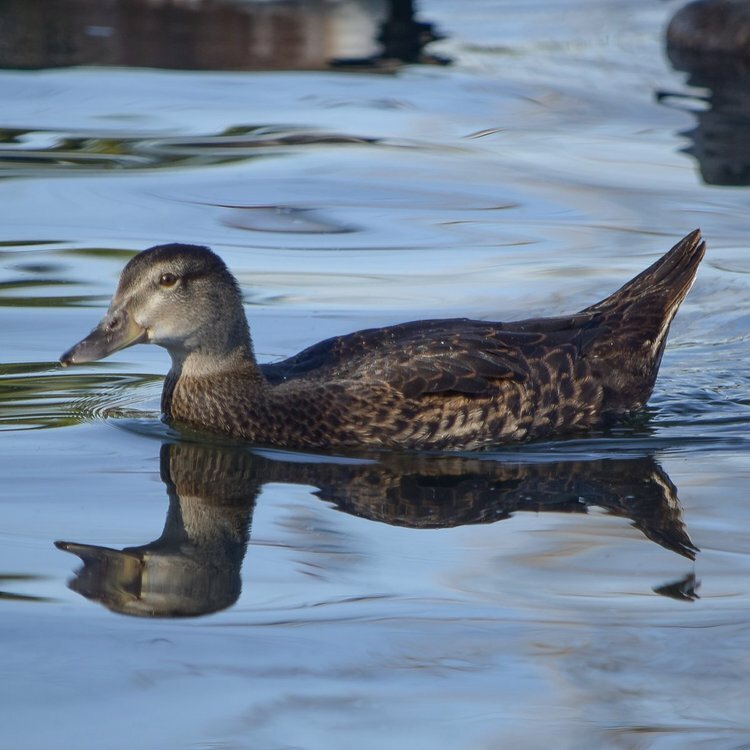 possible domesticated duck but as small as a wild mallard vs a domesticated mallard or pekin’s bigger size. BUMP. I'm not good with ducks, but from looking in my Sibleys Second Edition I would say Female Mallard. I would wait for others to chime in before I would settle. The face didn't look streaky enough to me for a female Mallard, and I would expect to see at least some trace of the white edging around the speculum. I'm not sure what's going on with that tail; insert NASCAR spoiler joke here. Looks like domestic ancestry to me. Definitely a domestic duck. Too dark for blue-winged teal, and a garganey would be very different overall. Initially, let me say anytime you see an odd mallardine in a suburban setting it is most likely due to domestic ancestry. However, I think we must consider the possibility that this is a Mallard x American Black Duck hybrid. The bill definitely looks like it could belong to a female AMBD. Also, the head coloring and streaking, as well as the overall coloring is acceptable for AMBD. The body feathers especially look like an AMBD. They are beige only on the fringes and darker brown in the middle. A Mallard would show a lot of beige in the middle of each feather. The only two things that are not like a female AMBD is the white that can be seen on the tail and the location. AMBDs should not be in California much less suburban LA. This could be explained by having some Mallard ancestry – I believe a hybrid can take up the migration route of either parent. It's probably a domestic of some sort but if this photo were taken in the East in an wild area I would say it's a Mallard x AMBD hybrid with probably more AMBD. he told me she was just a domesticated mallard, not that I doubted him but I also wanted a 3rd, 4th, 5th+ opinion. You know Paul, here in Ca, if it looks like a female Mallard but is slightly wonky, it's still a female Mallard. AMBDs should not be in California much less suburban LA. Not being familiar with west coast birds, I considered both Black and Mottled myself until I double-checked the range maps. It's definitely an interesting looking bird.